The number of iOS device users who have upgraded to Apple's latest iOS 7.1 update has grown over the past three days to account for 17.9 percent of all iOS traffic in North America, and is expected to overtake the previous iOS 7.0.6 update within a few days, one report says. 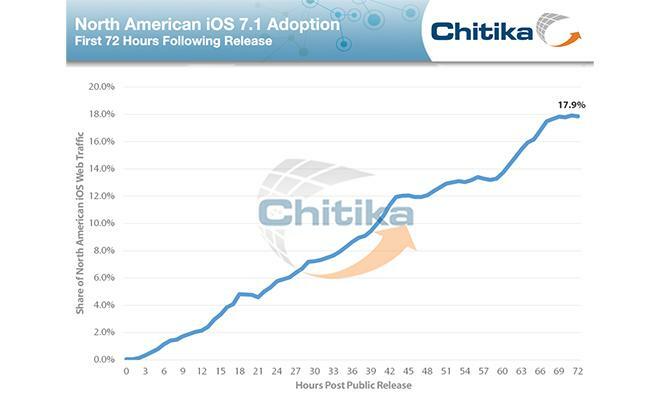 According to the latest statistics provided to AppleInsider by Chitika Insights —ad network Chitika's research arm —iOS 7.1 is hovering at a 17.9 percent adoption rate in North America 72 hours after launch. The numbers are in line with Apple's previous point updates. For the purposes of the study, Chitika Insights studied tens of millions of U.S. and Canadian online ad impressions originating from iOS devices from Mar. 9 through Mar. 12. The firm notes iOS 7.0.6 is still generating a lion's share of Web traffic, approximately doubling that of iOS 7.1. With a stable growth rate, however, Apple's latest iOS version is expected to push past iOS 7.0.6 within a few days. Apple released iOS 7.1 on Monday with a host of new feature additions and a laundry list of bug fixes and tweaks. While CarPlay (formerly iOS in the Car) hogged most of the spotlight, autos supporting the feature are months out. In the near term, Apple's latest batch of UI tweaks will likely be more impactful. In addition, iOS 7.1 brings a fix for a Touch ID "fade" issue where the system would slowly forget a user's fingerprint data.